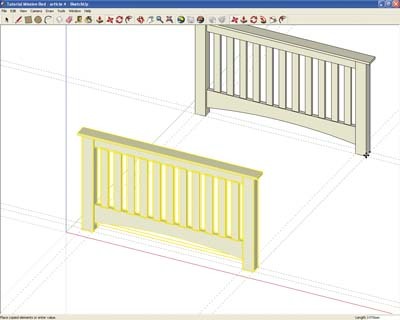 In the last issue, we finished with the footboard of our Mission bed completed, and in this issue, I am going to show you how to copy the footboard and edit its various components to make a headboard. 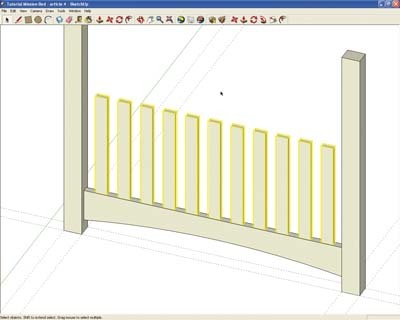 This is another one of those moments in 3D computer drawing when all the hard work you have just put in really starts to pay dividends. The ability of this type of software to edit pre-existing drawn components, to make them longer, shorter fatter, and change them in other ways, is probably the main reason for using it, rather than drawing things by hand. It is often quicker, initially, to sketch something out using a pencil and paper, but it's when you want to alter it a bit, or repeat something, that you start to make huge gains in time, and have much more fun into the bargain. It might help us at this stage to see what we are doing if we delete some of the guides that we used to construct the footboard. I would suggest that you delete all the guides that are above ground level and the easiest way to see these is to orbit your view so youâ€™re looking along and up at the footboard, a sort of mouse-eye view. Once you have cleared the air of unwanted lines, zoom up and out so that the footboard is in the bottom left half of your screen and the top guidelines are clearly visible where they cross the side guides. Now, select the whole of your footboard, and using the Move tool, click on the bottom right hand corner of the right leg and move your copy away to the right and upwards in the screen. Don't forget to hit the Ctrl key (Option on the Mac) to make a copy. You may need to zoom in again whilst you copying, so that you can 'snap' the corner of the leg you originally selected onto the correct intersection of the guides. Once your copy is in position, it might make life easier if we now hide the footboard. You can do this by windowing the whole thing, right clicking on the mouse and choosing the Hide function. Your carefully constructed footboard disappears - just invisible, not thrown into some digital furnace. 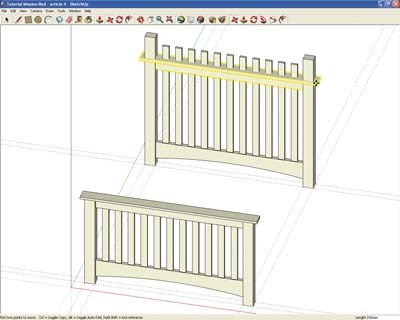 We also need to hide the capping piece and the top rail in the copy, as we need a clear view of the tops of the legs and of the vertical slats, so this will give you a bit of practice in making things disappear! The next step is to detach our new legs from their partner components. If we simply edited the legs without doing this, the other legs in the bed would change in the same way, i.e the two we have just hidden. This can be a huge advantage sometimes, but in this case we want the footboard legs to remain as they are. 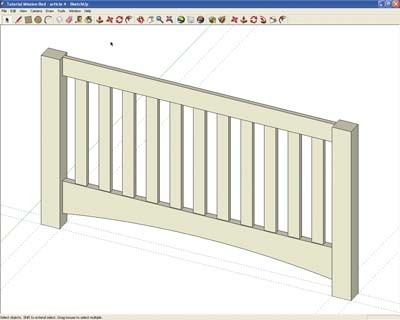 Therefore we need to select both headboard legs by clicking on one, holding down the shift key and clicking on the other, then right clicking on the mouse and selecting the Make Unique option. This will detach the top two legs from the bottom two. At this point you need to remember that each of the items in your drawing is a component, because to make any changes to components, you have to 'open' them. In other words, unless you engage a special editing process, you will be able to move your component around the screen, but not a lot more, and you certainly won't be able to make it longer, which is what you need to do. And the quickest way to start this process, is by simply clicking, not once, but twice - double clicking, as its called, on the thing you want to make changes to. So hopefully at this point your leg is highlighted, to show that it's ready to be edited. Notice also, that the rest of your drawing, apart from the other leg, is 'greyed out'. What we need to do now is lengthen the leg by 440mm to take it to a height of 1280 using the Push Pull tool. As we do this for one leg so the other will follow. (If it doesn't, don't worry too much. 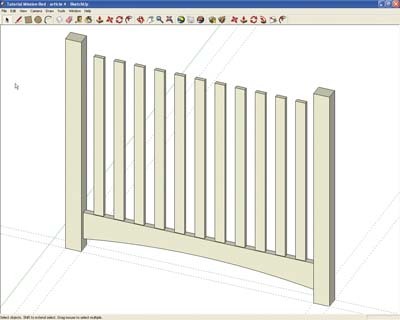 You can do that one separately) You can then follow the same procedure with the slats. 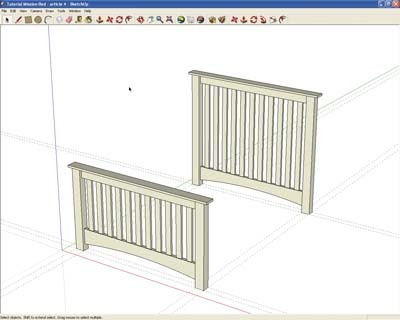 Select all the slats in the headboard, taking care not to include the bottom rail! 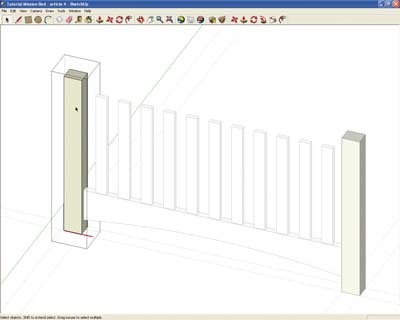 Right click anywhere on the slats and select the Make Unique function in the same way as before. 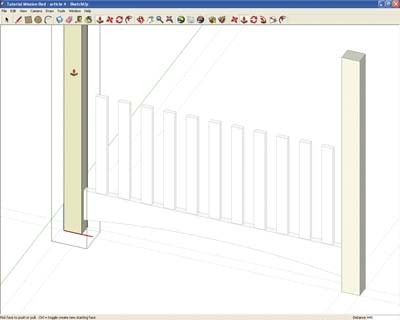 You now simply need to select one of the slats by double clicking, which will open the Edit Component facility, and lengthen it by 440mm in the usual way. 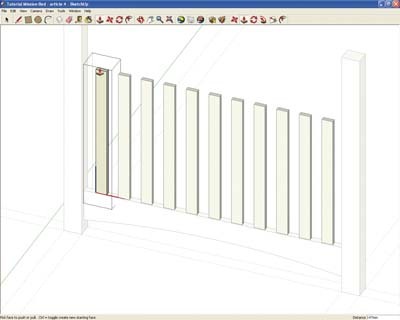 All the other slats will follow as if by magic, and in some ways that is exactly what it is! Having started my drawing career using tracing paper and ink pens, I will never take the amazing power available in today's 3D drawing programs for granted. All that remains for us to complete our new headboard is to make the top rail and capping piece visible again and to move them into their correct positions. If we select the Unhide All option from the drop down Edit menu, all our hidden components will become visible again, including the footboard, which I'm guessing you have been worrying about. Also, the capping piece and top rail will reappear, but 'impaled' on your newly lengthened legs and slats, which can certainly look a little unsettling at first. But it's okay, no damage has been done, and all you need to do is select these two items, and using the Move tool, position them upwards along the blue axis 440mm. Hey Presto, one finished headboard, parts of which may be a bit second-hand, but no-one will ever be any the wiser!